University of Louisville wide receiver No. 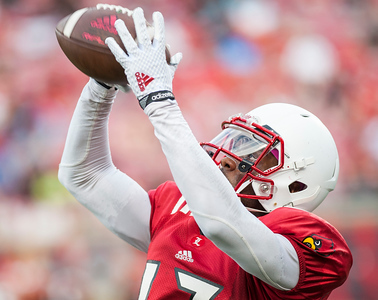 17 James Quick makes a completion during the Spring 2015 football red VS white scrimmage on 4-17-15 at Papa Johns Cardinal Stadium in Louisville, KY. Crowd turnout for the scrimmage was decent, but not record breaking, indeed, the scrimmage took place a day prior to a major Louisville event, a Kentucky Derby Festival event, Thunder Over Louisville. Louisville's Terry Rozier, No. 0, looks to the referee disappointed but understandingly following a jump ball called when his shot was blocked without a foul during a lay up late in the 2015 NCAA Tournament Elite 8 game for the University of Louisville Cardinals VS Michigan State at the Carrier Dome in Syracuse, New York on 03-29-15. The Cards and the Spartans fought well, but the eventually the Spartans were too much for the Cards to overcome. The Spartans defeated the Cardinals in overtime 76-70. 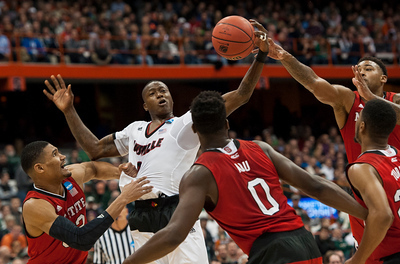 Louisville's Terry Rozier, No. 0, fights the Wolfpack for the ball during the 2015 NCAA Tournament Sweet 16 game for the University of Louisville Cardinals VS the NC State Wolfpack at the Carrier Dome in Syracuse, New York on 03-27-15. The Cards and the Wolfpack were neck in neck for much of the game, but the Cards eventually prevailed in a 75-65 win, much thanks to Rozier who got 14 of the Cardinals' 34 rebounds. The Wolfpack proved throughout the season that they should not be taken lightly, defeating not only the Cards in a tough loss, but also highly ranked Duke, and then defeated the No. 1 seed Villanova in the first round of the tournament. The entire UNI Panthers team stops for a moment and watches the unstoppable, Montrezl Harrell. The University of Louisville played the Panthers in a 2015 NCAA East Region Tournament Round 3 game at Key Arena on 3-22-2015 in Seattle, WA. Although the Panthers played well, they were not able to slow down the Cards on their advance to the Sweet 16. 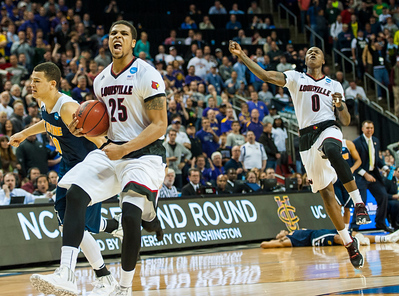 University of Louisville's Wayne Blackshear No. 25 and Terrry Rozier No. 0, celebrate a hard fought win against the thirteen seed UC Irvine Anteaters in the 2015 NCAA Division I Men's Basketball Tournament 2nd Round game on 3-20-2015 at Key Arena in Seattle, Washington. The Anteaters were a low ranked team among the East region, especially as compared to Louisville, thirteenth versus fourth, but they proved to be a formidable adversary. With the help of No. 34 Mamadou Ndiaye, the 7' 6" tallest player in the NCAA, the Anteaters gave the Cards a run for their money keeping within a shot of winning or tying for the last several minutes of the game. With the Cards up by two points, in the final seconds of the game, the Anteaters had the ball and were making a go at scoring, but Terry Rozier made a steal and passed on the ball to Wayne Blackshear the moments before the clock ran out. 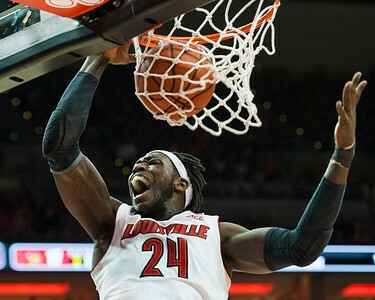 Montrezl Harrell (no. 24) of the men's basketball team making a dunk while playing in the final regular season game for the University of Louisville VS University of Virginia on senior night on 3-7-15 in Louisville, Kentucky at the KFC Yum Center. When playing against the Cavaliers, the Cards were ranked No. 16 while the Cavaliers were ranked No. 2. With only seconds on the clock and down one point, Mangok Mathiang (no. 12), playing for the Cards, shooting his only shot in the game, scored a jumper from near the free throw line to pull the Cards into the lead. The game was a substantial win for the Cards given that the season had been a rough one despite their fair, but not great ranking. This was the Cards first season in the ACC, full of tough rivals, but this was not the greatest source of their woes. With only a few games left in the season, key, star player Chris Jones (no. 3) was released from the team, leaving a crucial gap in the Card's defense. Fighting against the odds and making up for several difficult losses following the loss of Jones, the Cards showed up and made the win. 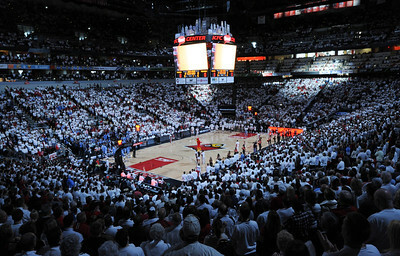 The KFC Yum filled with fans with the lights down and the spotlights on moments before the Louisville Cardinals starters are presented during a white out game against North Carolina. The Cardinals fought a long hard game, taking the lead in overtime to earn the win. Bria Smith (no. 21) of the women's basketball team playing in a regular season game for the University of Louisville VS Miami on 1-25-15 in Louisville, Kentucky at the KFC Yum Center. 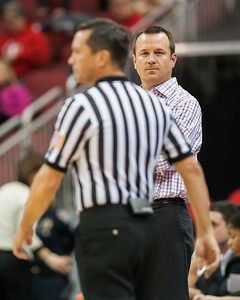 Head coach Jeff Walz of the women's basketball stares down the referee following technical foul that was called on him during a regular season game for the University of Louisville VS Miami on 1-25-15 in Louisville, Kentucky at the KFC Yum Center. Terry Rozier (no.0) of the men's basketball team playing in a regular season game for the University of Louisville VS University of North Carolina Wilmington on 12-15-14 in Louisville, Kentucky at the KFC Yum Center. 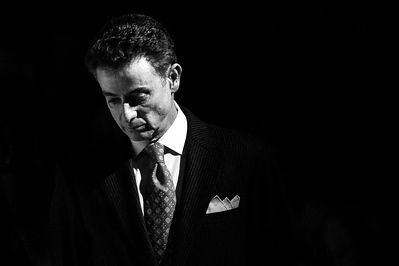 Louisville head coach Rick Pitino of the men's basketball team slowly paces the sidelines while Louisville's game starters are introduced under spotlights before a regular season game for the University of Louisville VS Jacksonville State on 11-17-14 in Louisville, Kentucky at the KFC Yum Center. Roxanne McVey (no. 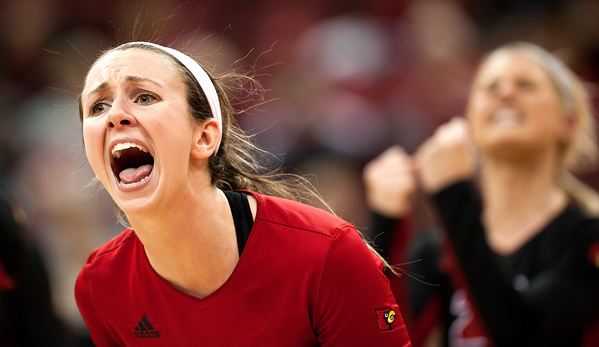 15) of the women's volleyball celebrates following a play in a regular season game for the University of Louisville VS Virginia on 11-2-14 in Louisville, Kentucky in the KFC Yum Center. Daniel Keller (no. 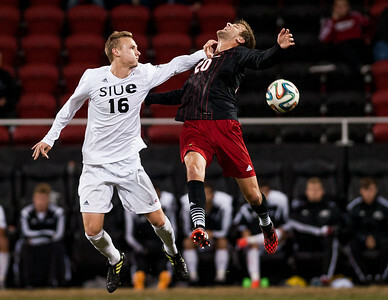 20) of the men's soccer team playing in a regular season game for the University of Louisville VS SIUE on 10-28-14 in Louisville, Kentucky at Lynn Stadium. Erin Yenney (no. 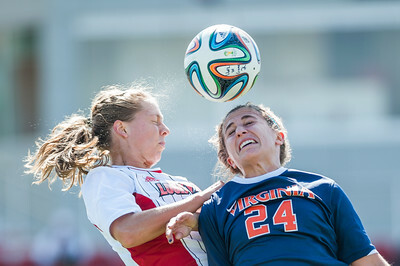 16) of the women's soccer team playing in a regular season game for the University of Louisville VS Virginia on 10-19-14 in Louisville, Kentucky at Lynn Stadium. Ivan Gutierrez (no. 19) of the men's soccer team jokingly checks on his teammate Tim Kubel (no. 22) who is still laying on the ground following an unexpected big win against no. 4 ranked Syracuse playing in a regular season game for the University of Louisville VS Syracuse on 10-17-14 in Louisville, Kentucky at Lynn Stadium. Jerry Ramirez (no. 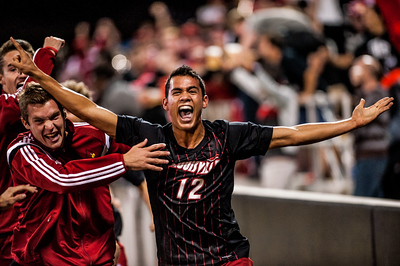 12) and other members of the men's soccer team celebrate following the game winning shot scored by Ramirez in overtime during a regular season game for the University of Louisville VS Syracuse on 10-17-14 in Louisville, Kentucky at Lynn Stadium. Kari Weinland (no. 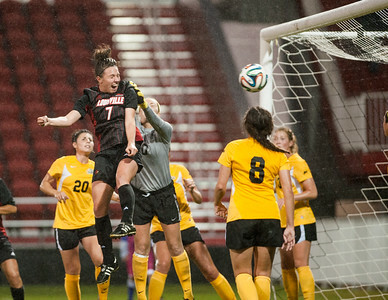 7) of the women's soccer team heads in the winning goal, for a 1-0 score, during a regular season game for the University of Louisville VS NKU on 10-15-14 in Louisville, Kentucky at Lynn Stadium. Kaela Dickerman (no. 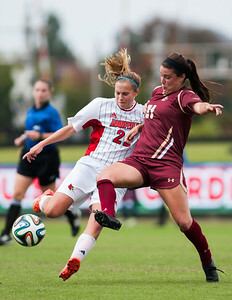 22) of the women's soccer team playing in a regular season game for the University of Louisville VS Boston College on 10-12-14 in Louisville, Kentucky at Lynn Stadium. Lotta Kahlert (no. 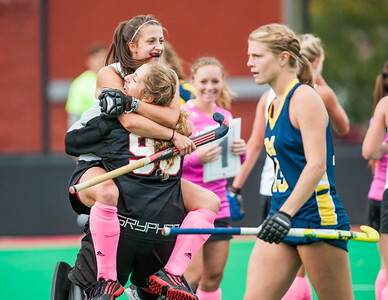 18) the women's field hockey team leaps into the arms of goalie Elina Pereira (no .99) in celebration following a goal she scored in double overtime during a regular season game for the University of Louisville VS Michigan on 10-5-14 at Trager Stadium in Louisville, Kentucky. Ricardo Velazco (no. 9) of the men's soccer team playing in a regular season game for the University of Louisville VS Ohio State on 9-30-14 in Louisville, Kentucky at Lynn Stadium. Ricardo Velazco (no. 9) of the men's soccer team takes a shot on goal while playing in a regular season game for the University of Louisville VS Ohio State on 9-30-14 in Louisville, Kentucky at Lynn Stadium. Will Vitalis (no. 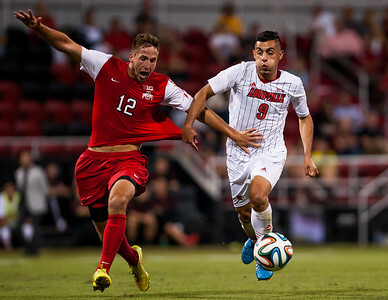 10) of the men's soccer team playing in a regular season game for the University of Louisville VS Ohio State on 9-30-14 in Louisville, Kentucky at Lynn Stadium. Shane Campbell (no. 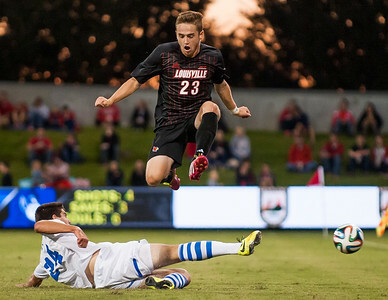 23) of the men's soccer team playing in a regular season game for the University of Louisville VS Duke on 9-13-14 in Louisville, Kentucky at Lynn Stadium. Romilio Hernandez (no. 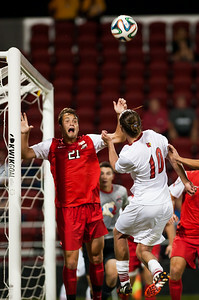 14) of the men's soccer team playing in a regular season game for the University of Louisville VS Cornell on 9-5-14 in Louisville, Kentucky at Lynn Stadium.